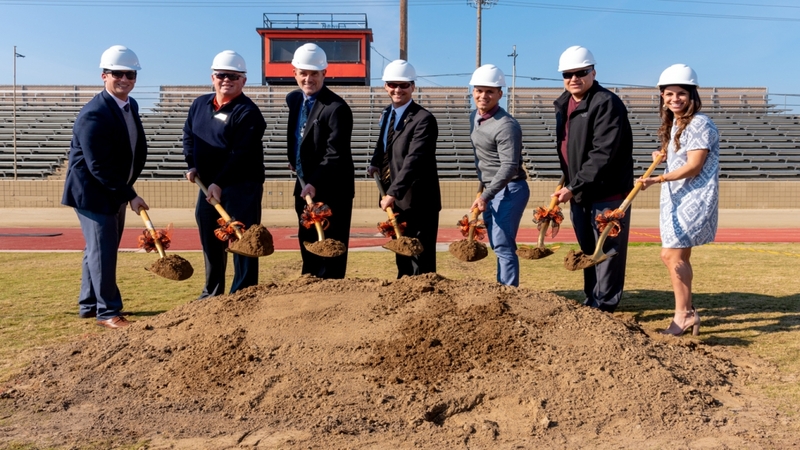 Selma High School is getting a new stadium, and on Thursday they held a groundbreaking ceremony. It’s been nearly 30 years in the making. “Our students have not had a stadium like this and now I’m proud to have one like this.” said track coach Haskell Henson. Henson is a Selma High grad, class of ’61, and is excited to see changes are being made – especially since this was the same stadium back when he was a teen. “I was one of the first ones on this field when it was built. I was on the football team here. I came through that gate. I can tell you it was really exciting at the time,” he said. It’s been over 55 years. Now the paint is chipping, the track is dirt, making it hard to train on after it rains. And the bathrooms — well, they aren’t the best. Henson is looking forward to an all-weather track, hoping to give his athletes a fair shot. “It will give us an equal opportunity to compete with other schools, that’s the name of the game. An all weather track definitely draws athletes and makes the workouts better,” he said. And speaking of workouts, part of the new stadium includes an updated weight room — something the football team is eager to get. “Our weight room is a little small so I’m hoping that’s going to be a big upgrade,” said football player Michael Renovato. The new facility will cost between $10 million and $12 million. It’s being funded through measure O which the community voted on. 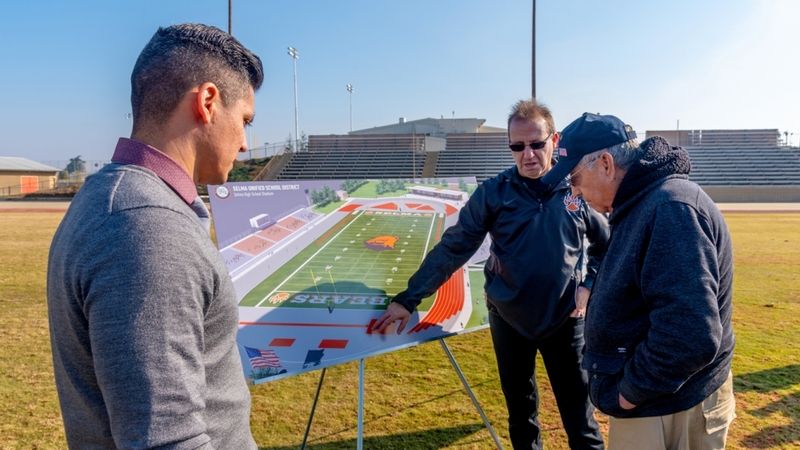 Tony Pavone (TETER Project Manager) and Randy Esraelian (Selma High Athletic Director) shows a community member a rendering of the new stadium. Superintendent Dr. Tanya Fisher says this stadium will serve more than just the students. “We are over the moon excited. We will be able to hosts events and folks from other areas will be able to come into the community which is a boost to community and businesses. So it not only helps our school but it helps the community as well,” Fisher said. 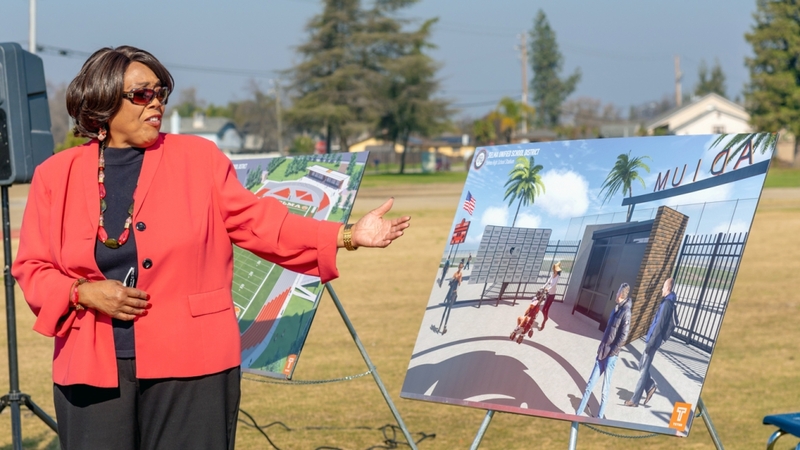 Dr. Tanya Fisher, Selma Unified School District Superintendent, admires the donor wall rendering (designed by TETER) at the groundbreaking ceremony. They hope to have the stadium completed by this fall. The superintendent says she plans on having weekly meetings to make sure everything is on budget and on time.